I finally got another Fix. I have to admit, while I do need clothes for a conference at the end of the month, the real reason I finally scheduled a Fix is because they were waiving my $20 styling fee. So, win-win! So the strongest 'requirement' for my conference is to have a black dress for our 'Breakfast at Tiffany's.' And I actually get a silver Tiffany's bracelet onstage during this one. 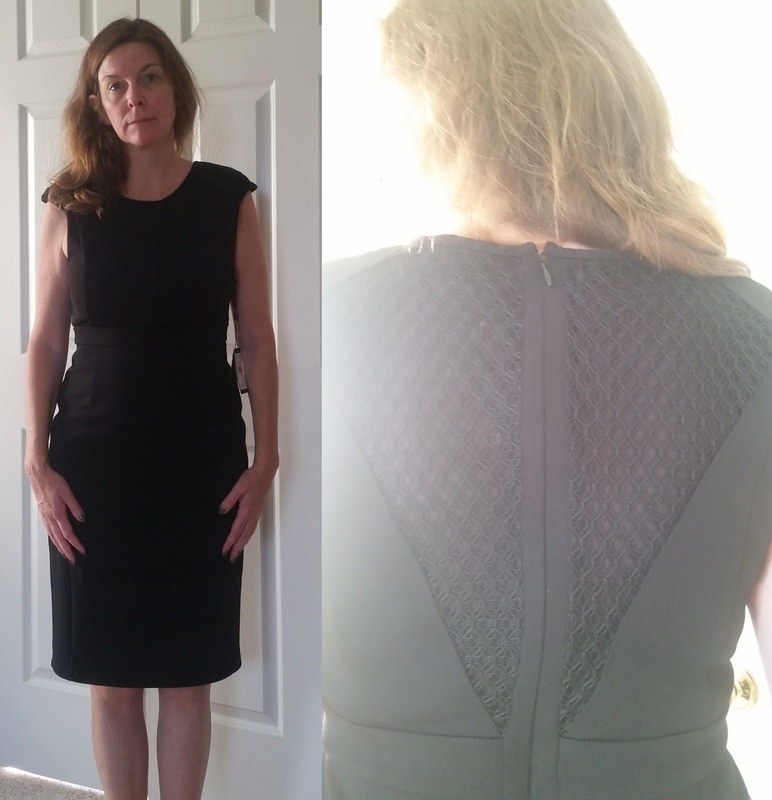 My stylist noted that most of the rockabilly or vintage black dresses I had pinned on my Pinterest board weren't a style she had available, so she picked this classic Adrianna Papell Tallulah Dress (retail $98) for me. The dress went right to the return bag. Not really sure what I'll wear to the event, but luckily black is sort of a wardrobe staple for me. I really wanted to like this outfit. I'd also mentioned to the stylist that pink, black, and white are sort of basic colors of the company for which I'm attending the conference. A wrap shirt like this Skies are Blue Capaldi Surplice Cross Front Fitted Knit Top (retail $54) is usually flattering on me, and I do like pencil skirts - the colors in the 41Hawthorn Blanche Sweater Knit Skirt (retail $58) were perfect! I'll admit I've put on a little weight, but I look like a stuffed sausage to me in this outfit. The shirt just isn't flattering at all, and the straight skirt (seems simple enough) kind of buckled in the front when I moved. My regular brand of straight skirt doesn't do this in any of their fabrics. Quite disappointing. Both of these items went to the return bag as well. And here's that shirt again. Boy, I really wanted to like that. This time it's paired with the Dear John Finnegan Cuffed Shorts (retail $58) and the Pixley Kiata Embroidered Lace Collarless Jacket (retail $88). I have to reiterate again that the stylist (Frances, by the way) was really paying attention to my note! I mentioned that the conference rooms were typically cold at these events, and I'd love a new, less bulky cardigan to stay comfortable. On paper, this sweater should have been great! But on, it was a very textured lace, and I was worried about snagging it on things. After paying that much for something, I want to be able to wear it, relax, and enjoy, not watch for chairs or corners coming too close. I put it into the return bag. The shorts were another item that just scared me about my body. I liked the way they looked on (mostly), but I felt like I was stretching that waist to the limit. Back they go! Overall, I kept nothing, and the Fix really has me questioning my own assessments of my size and style. I've since gone back to my profile to update how I like things to fit. I probably sabotaged myself with my item requests - they may not have been things that really fit my changing body. I haven't tried Stitch Fix yet ... I am pear-shaped so it's hard to find things that fit me, usually. I like that black cardigan on you and also the shorts :). Very nice. I haven't tried Stitch Fix, but I know a few people that have and they all have such a good things to say about it. I heard they have kid's clothes too. You hardly look like a stuffed sausage, although the comment did make me chuckle! I hope you find the perfect black dress! I tried Stitch Fix for a while but it just didn't work out for me. I did keep a few things and found a few new favorite brands, though. I think the black and white wrap skirt is great!